Why pay more to print? To ensure reliability and top quality, Cartridge World’s professionals remanufacture and refill inkjet cartridges to the highest original equipment manufacturer (OEM) standards, which is economically and environmentally responsible. Every remanufactured ink cartridge from Cartridge World is cleaned and inspected for damage or wear, and then the ink cartridge is refilled and tested in a printer to assure the highest quality standards. Our quality is assured for any inkjet refill, whether a black ink cartridge or a color ink cartridge, or any inkjet printer. Only a skilled technician can refill an inkjet cartridge properly, which is not surprising when you consider that each inkjet nozzle is microscopic – about one-third the circumference of a human hair. 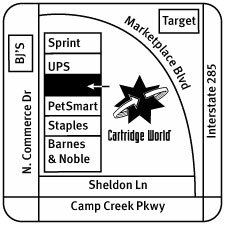 Cartridge World stores take pride in each top quality ink cartridge refill they deliver. Cartridge World has spent 20 years refining the process of ink cartridge refill. With our 1,700 stores worldwide and dedicated franchisees and top notch technicians, you can be assured of a quality product that you can depend on. We guarantee it.